They say what happens in Vegas stays in Vegas. Our camper van really takes this a bit too literally. On our last big mapping trip at Red Rock Canyon the van left behind her engine, multiple power steering pumps, and multiple alternators (see Camper Van Epic in Vegas). Now, as we pulled into Vegas and turned on the air conditioning, the only thing that came out was hot air. Rick and I looked at each other in dismay - the level of dismay that only comes with previous mechanical-related trauma. I think I may have even seen droplets of liquid hovering at the base of Rick's eyes (or maybe that was my own blur-induced-sprinkles tainting my view) before he let out a primal roar like no other. Good job Rick, release that toxic energy! We knew with the rising temperatures, the AC needed to be fixed ASAP. We thought it would be fairly easy, but after making several phone calls I learned that (1) specially certified technicians have to work on ACs. This meant it would be a few days before we could get an appointment anywhere. And, (2) vehicles built prior to 1994 used the old R12 gas (bad for the environment) and needed to be converted to the R134a (still not great for the environment, but not as bad). The lady on the other line asked if our car had been converted. I had no idea. This was starting to ring "cha-ching" bells in my head. When I revealed this information to Rick we had another moment of shared "REALLY??!!" dismay. 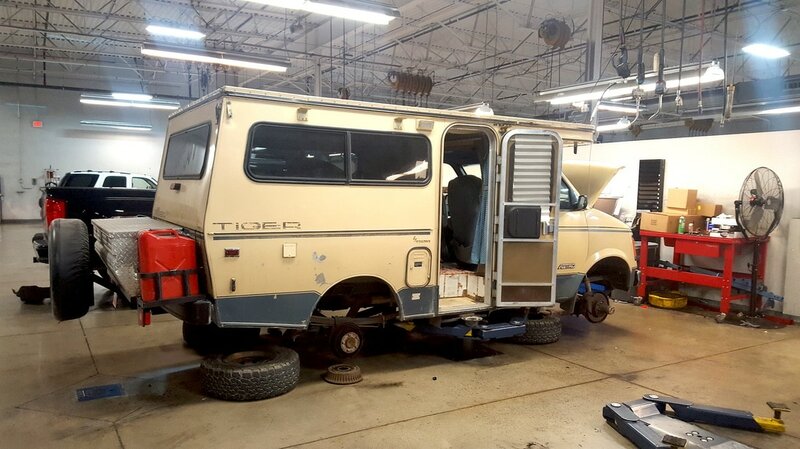 We decided this time to take The Tiger to the Chevy dealer - people who knew Chevies. We set up an appointment for Thursday. Thursday and Friday - car not ready. We asked if we could come in and get more items out of the van (which is when we snapped the photo below). Saturday - car not ready. Sunday - no work on the car. Monday, Tuesday, Wednesday - car not ready. The front end is a completely different make of car (Ford - possibly a Bronco circa 1985ish). So, they ordered 1985 Ford Bronco rotors. But, low-and-behold, the holes would not align with the wheels, which were GM. They had to get the rotors specially-machined, which took several days. Finally, on Thursday, (one week later) we were able to get van. Thank goodness, the AC worked. The brakes worked. On Friday we finished up mapping at Red Rocks (yeah! ), and headed of to Joshua Tree again. We were merrily cruising along in the hot desert valley floor with the AC flowing, then the temperature light came on! You have GOT TO BE KIDDING! Double dismay!! We pulled over, checked the fluids - good. We let the van cool down and tried again. On the next long hill, the temperature light came on again. Rick and I then flashed-back to our childhoods, recalling the good ole' days when you could not run your AC on hot days while chugging up long hills. We hoped this was the problem and decided to test it. We rolled down the windows, cranked on the heat the help dissipate the heat from the engine, and it worked! The temp light turned off. Now you may wonder, if we have to do that, what's the point of having an AC? Well, fortunately we found dealing with the hot long uphills is not really a big deal. It is temporary. As soon as we reach the top, we turn on the AC again, and the world - and our sweat - is back in balance. And, it builds character... or so we tell ourselves.